Palo Alto University's B.S. 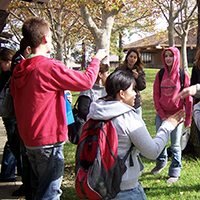 Psychology and Social Action program is an undergraduate psychology major designed for college transfer students to complete their degree in two years. The program is designed for students who have a passion for psychology and who would like to make a difference in their communities and in the world. In the second year of the program, students put their education into action when they complete a 9-month internship in a non-profit or community agency. The theme of the program is "the science of social action in a global community." Coursework includes classes in psychology, anthropology, sociology, economics, philosophy and social action. Students also have opportunities to participate in research projects with graduate faculty. The combination of coursework in psychology and the social sciences--plus a nine-month internship--provides students with theoretical knowledge about the science of human behavior along with practical experience in bringing about change in individuals and in organizations. Graduates are prepared to work in diverse cultures and communities. The program is an excellent foundation for graduate studies leading to careers in counseling or clinical psychology. The Early Start Program enables qualified PAU undergraduates to enter PAU's M.A. in Counseling program, which prepares students to become licensed Marriage and Family Therapists and/or Licensed Professional Clinical Counselors. The PAU B.S. Psychology and Social Action degree is accredited by the Western Association of Schools and Colleges.